Pizza restaurant for sale in Aurora, CO has brand new, fresh build-out! Location is a prime spot and everything is in place for a new owner to take over! Get into this pizza restaurant for sale in Aurora, CO for less than the cost of building out your own. The current owner had an opportunity fall into his lap that he couldn't refuse, and now you can own your own business. Location is in a packed, very large strip mall with large anchor stores and hundreds of parking spots. There are no other similar businesses near these major cross streets to compete! People are searching for a pizza restaurant for sale left and right, and this one is fully equipped and ready to operate! With steady and continuous growth in the Aurora area, this business is ready to go and has all the equipment to turn out pie after pie and slice after slice. The purchase of this location offered by We Sell Restaurants will include a hood, grease trap, industrial ovens, bake lines, walk-in coolers, prep tables, dough mixers and more. The brand new massive hood and grease trap alone were over $40,000! Everything is up to code and current owner plans to go through with opening the doors and getting the business off the ground for the next owner. Can you say opportunity? 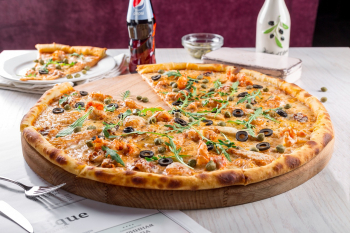 Offered exclusively by the restaurant brokers, this is a pizza restaurant for sale of ours that is in a great location surrounded by very large residential communities that are filled with - you guessed it - families that can't get enough of this Italian staple! Not only do they want their pie, but they want it to be convenient - no problem, this location has them covered on all bases! With a choice of delivery or take out, this place serves up just what they are looking for. This location has 1300 square feet to serve patrons at a comfortable $2573 a month including CAMS. An independent pizza restaurant for sale like this is unlike any of the large chains. With sales for this Italian staple up to 134 billion worldwide, and 45 billion of that number being in the USA, this one is a no brainer! Fully equipped and operational restaurant has all the equipment you need!